I made this little piece in early 2018 as a sort of precurser to a much larger work, Familial Wounds. I was getting a feel for the breadth and speed of the gradation. It is now framed and titled. OUT! 7” x 5” | 18cm x 13cm. Smalti. I made this fun little mosaic last weekend for my daughter’s 30th birthday. This may be the 2nd time in over 20 years that I have ever made a mosaic in a weekend, if indeed there has already been a first time. I like this concept and will be playing around with it some more. Here are a couple of detail shots from my recent work, Familial Wounds. This piece was meant to be a fun little diversion. 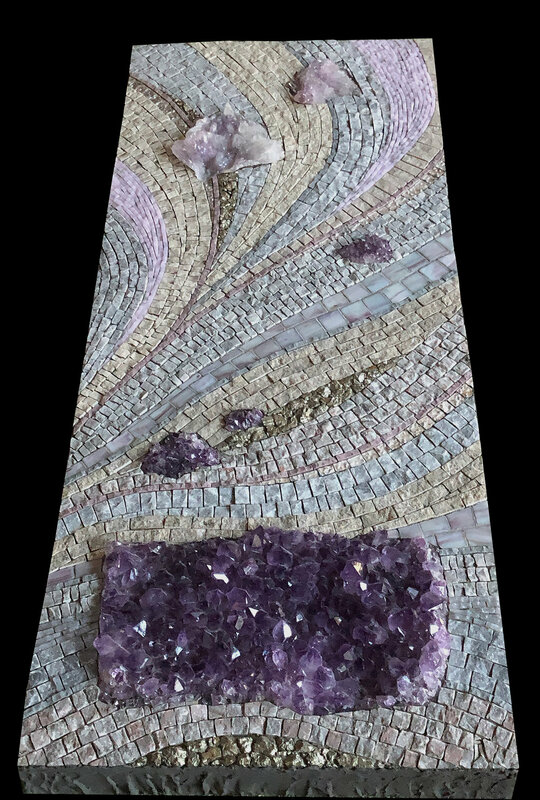 After I finished Stabby, I wanted to just play with some of my back yard shale—the 8 large pieces of stone— and some special stones—5 small rocks— that were gifted to me by a fellow mosaic artist. The large shale piece in the lower right of the mosaic cracked as I was cementing it in place; however, only the topmost layer of it cracked. The crack was too rough to leave it, so I played with spreading it a little bit. This created the crevice. If you look at it closely, you can see that although it looks like two pieces, it is actually a single piece. As I contemplated what to do with the crevice, it seems that Kilauea's activity on our family's favorite and much-visited Hawaiian island called to me. Before that, I was just going to use green shades of smalti for the piece. I just happened to have some red/orange/yellow scraps from previous projects, as well as some blues, so I decided to rely on scraps as much as possible. As it turns out, I only put a dent in the red scraps. As I worked, I began paying more and more attention to the andmento. This turned out to be the most challenging thing I have attempted—andamento wise—since Giulio Menossi's portraiture classes. The flow areas around the large shale pieces average an inch or less, so the smalti is cut quite small. What started out as a fun little diversion turned into a multi-week, serious technical exercise. Ugh! How did this happen? Why can't I just play? And, another familiar refrain: What was I thinking??? I ended up reworking a few areas that were done earlier, of course, because I just couldn't let it go, could I? It was very difficult to flow the smalti around a couple of areas in the shale pieces and the stone obstacles—a.k.a. land masses and islands, and there are a couple of areas that I'm still not completely happy with, but I'm calling it done! Stabby seems right at home in my daughter's beautiful San Jose condo. Her new console table, which will sit directly beneath the mosaic, won't be delivered for a few more weeks, unfortunately. Of course, I'll want a photo of the complete effect once the table arrives, which I trust Allison will be able to provide. She is absolutely thrilled and happy with her totally unique custom mosaic, fashioned after her own pixillated unicorn head design. (See previous posts about this mosaic here.) I'm happy with it too! Past Life 60" x 36" | 91cm x 152 cm. Vitreous, slate, jasper, agate, moonstone, snow quartz, prehnite, mother of pearl, celestite, rhyolite, rhodonite, pyrite, copper, ceramic, mosaic gold, other glass. Okay, here are final pics of this past life saga. With the help of my husband and son, we successfully hung it last weekend. It is very heavy, at least 60 lbs., although my husband thought 75. The ceramic and slate tile border is a good part of that weight. I used a Z-bar type of hanger and managed to install the wall side of the hanger perfectly level! A fitting reward to mark the end of this 19-year effort. A window is directly opposite of the mosaic, and this provides varied lighting throughout the day. These photos show during the day and then later with much less exterior light. I'm on to new work! 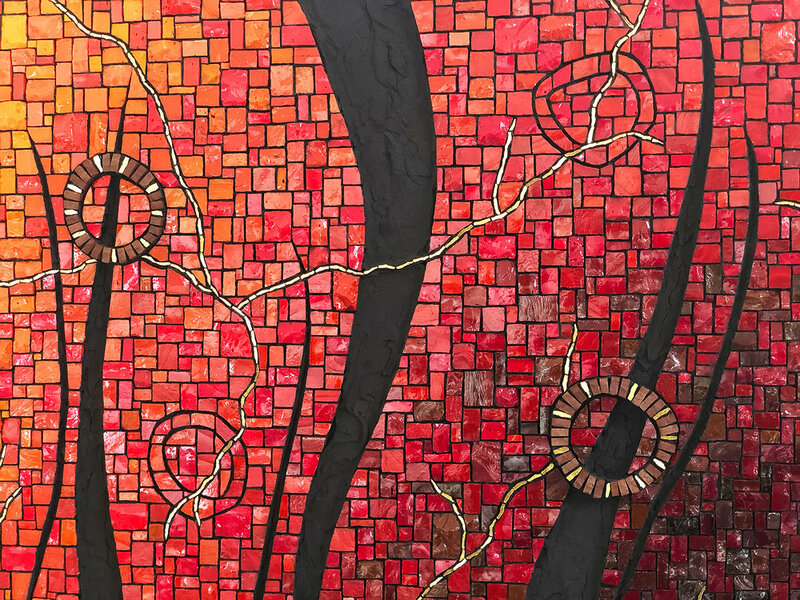 Past Life (1999-2018) 60" x 36" | 152 cm x 91 cm. Vitreous, slate, jasper, agate, moonstone, snow quartz, prehnite, mother of pearl, celestite, rhyolite, rhodonite, pyrite, copper, ceramic, other glass. I. Can't. Believe. I. Finished. It. It's finally finished, and it only took about 19 years! I enjoyed working on this during the past few months. It was nice to not obsess about it, to work more loosely, and to not be attached to an outcome. Please forgive the photo. This is the best I could get with it still on my work table. The light from the skylight is making the left side of the water look too light. I will try to get a better photo once it is hanging on a wall. Actually, the water and the darkest part of the sky are the same color. Bad lighting. The border. Hmm... One of those what-was-I-thinking kind of things. It is a bit heavy, but the multi-colored slate is a very pretty tile. I like the sky colors—actually all the colors. The moon may be a bit too bright. I'm pondering whether to put a very light gray wash on the white grout. I intended to have more movement in the sky, but after I got past the first layer above the mountains, I seemed to settle into no movement. I was aware of this, and just decided to go with it. I give myself a passing grade of C on the sky gradient. I'm not very good at this kind of thing, and I would normally obsess over it and rework and adjust like crazy, eventually yielding something that makes it look like I know what I am doing. No obsessing here; no standing back to get perspective. The lower gradients are not as good as the top-most one. I think I was getting the hang of it by the time I reached the top. It was challenging using different-sized pieces. I still don't like the interior shape in the moon, but the white grout helps to soften it. When I decided to finish this, I also decided that I would not change anything that had already been done. If I would have changed one thing about it, it would have been that moon; the frame comes in a close 2nd. Back in 1999, I named this Fullness. However, in the past couple of weeks, it demanded a new name. It is now titled Past Life. I think that I finished it—19 years after I started it—in a way that is harmonious with its haphazard and amateurish beginnings. Here's a preliminary photo of my recent commission. I'll get final pics after I frame it; it is currently shown in a digitally created frame. The client wanted something in the same style as On The Horizon, and especially wanted some amethyst. Almost as soon as we started discussing it, I had a strong intuition to abstractly express both her husband and herself, and their relationship, but I did not initially share this concept. I asked what minerals her husband was more attracted to, and he claimed turquoise. A couple of days later, I presented her with this idea to do two faux panels, one for each of them, and have them relate and connect with each other via the flow. She really loved the idea! Magnets 2" x 2" | 5 cm x 5 cm. Mirror and Van Gogh glass. So, after finishing up all those frames, I decided to have a bit of fun making these little magnets. I used some scrap 1/4" thick masonite for the bases, and was able to use mostly leftover tess from previous projects. Then, I decided to include them in my online store, which I mentioned a few weeks ago. I've been working many hours to get the store front set up and—my goodness—what a lot of work that is! Even though I don't have many items, it's still a big project: photos, pricing, packaging, shipping! It's a whole new world, and my hat's off to all of you who have already tackled this. In listing the magnets on the store front, I needed to come up with names for all these little guys, and that was actually a fun diversion. I just named them after family and friends that came to mind as I considered each magnet. I know that I keep saying that I am ready to get to work on that art piece, but I'm going to stop saying that. I will allow myself to work through some more of my decorative inventory for at least another month or so. And who knows, maybe longer! It feels good to be making use of some of the things that I've collected over the years. Bronze, Gray, Silver Mirror. 29" x 37". Mirror and Van Gogh glass. The sixth and better-be-last mirror frame that I will do for quite some time, this bronze, gray and silver one is really quite pretty. This photo, although better than I thought I would be able to get, does not do the mosaic frame justice, but I'm going to try to live with it for awhile before deciding to pack up all six mirrors and take them in for professional attention. Since the outside light was fairly favorable when I took the above photo, I decided to work the other five. The results were mixed, but mostly more successful than the previous photos, so I will share them here. Blue, Purple, Aqua 16" x 21" Mirror and Van Gogh glass. Blue, Yellow, Turquoise 14" x 17.5" Mirror and Van Gogh glass. Gray and Blue 18" x 16" Mirror and Van Gogh glass. 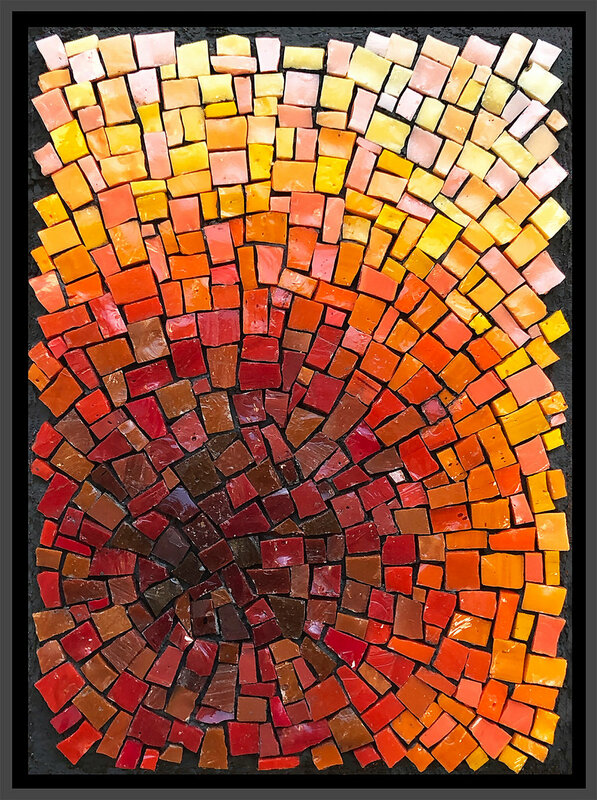 Red, Rose, Bronze 21" x 17" Mirror and Van Gogh glass. Exterior morning light. Red, Rose, Bronze 21" x 17" Mirror and Van Gogh glass. Interior studio lighting. Just look at the difference between the two above! My goodness! I think that the photo on the right is a little better in quality than the one on the left, which I took this morning. Not sure why I've had such trouble with this one. The one on the right is, of course, closer to what it looks like inside, which is where it is meant to hang. It feels very gratifying to have mosaicked these six mirror frames—four frames that I've had for years, and two old mirrors (the largest ones). It's a bit like purging while cleaning house, but I guess I did not really get rid of anything, I've just transformed them. And I do so love to transform things. Of course, I have Lucy to thank; were it not for her ACL surgery, I probably would have moved on to some art work. I'll trust that the time was just not right. But soon it will be! I plan to get back to an old art piece in the next week or so. Clockwise from top: Blue, Yellow, Turquoise 14" x 17.5; Grays with Blue 18" x 16"; Blue, Purple, Aqua 16" x 21"; Red, Rose, Bronze 21" x 17". Van Gogh and mirror glass. I've finished those four frames that I had—mosaicked them, installed beveled mirrors, and then framed them in floater frames. I'm satisfied with my efforts. I photographed them today, and I was sorry that my cool photo studio was not as helpful as I would have liked it to be for these mirrors. The larger mirrors, in particular, were difficult. I did my best, but still had imbalanced lighting and reflection. They were not as sharp as I would like, especially the larger two, and especially the blue of the larger two. These will have to do for now. Maybe when the weather clears up, I will try outside. I think that most of the difficulty is due to the glass tiles, and certainly the mirror tiles. I still have high hopes for photographing art pieces, and my results with the bottles were overall acceptable. Two more mirror frames to go! 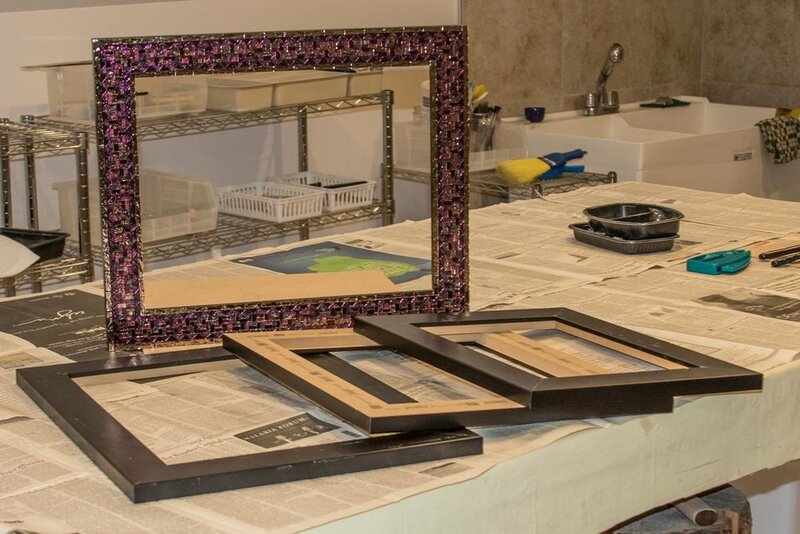 I had a couple of mirrors stored away, in frames that I did not like, so I removed them from their original decorative frames and decided to go ahead and make new frames for them while I am deep into this decorative phase. 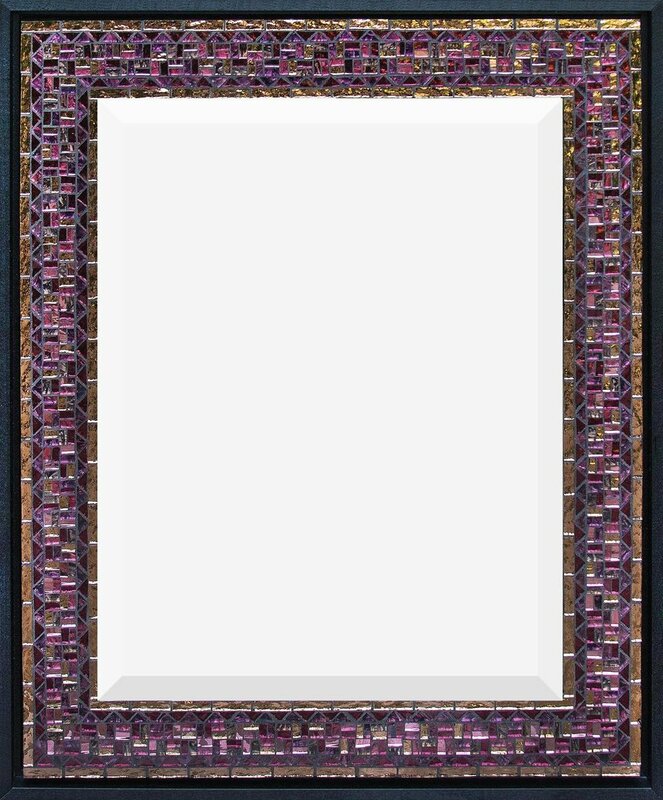 These are larger frames with 4" surface to mosaic, versus the 2" of the above frames. Maybe by the time Lucy's knee is healed, I will be finished with these two mirrors. In a previous post, I mentioned four frames that I had acquired some years ago. They are all odd sizes so I need to have the beveled mirrors custom made. 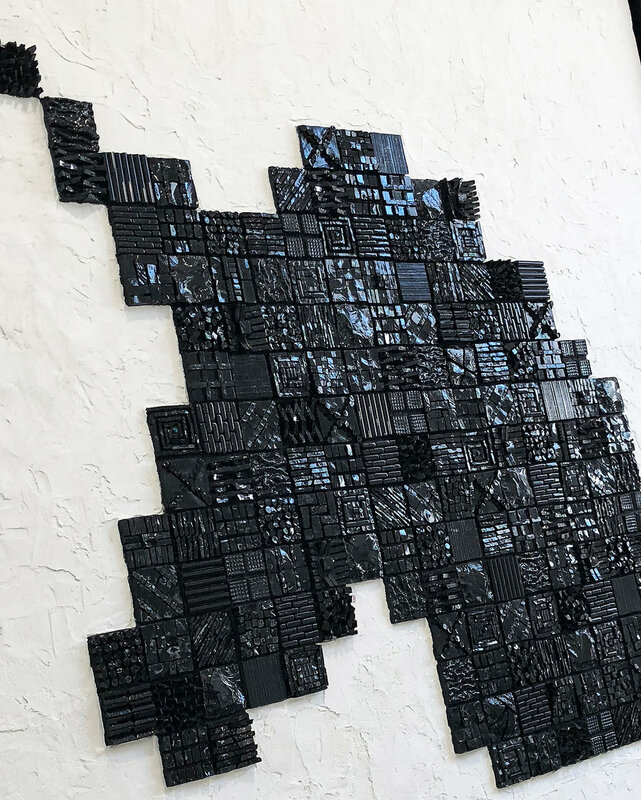 The one standing up in the photo above, which I just finished mosaicking—but not grouted yet— is 16" x 19.5",and is the largest of the four. They each have a very nice matte black finish and it pains me to have sand down such a nice finish in order to improve adherence. My plan is to put the beveled mirrors in them, and then possibly frame then in wood floater frames. They should be very pretty. So, this is what I have been up to in my kitchen while closely monitoring Lucy as she recovers from her knee surgery.